For Indian space scientists who are planning a second, and more ambitious, outing, to Mars in 2020, including tests of the Martian soil by a lander, the results of an experiment at Wageningen University & Research Centre in The Netherlands, could well prove to be like manna from heaven. For one, the experiment carried out by Dr G.W.W. Wamelink, a senior ecologist, has thrown up a surprise arrival of two offspring of the earthworm in Mars’ soil stimulant — signifying reproduction in alien mud — and the possibility of these earthworms making the loam more fertile for growth of all types of plants. For Indian scientists who are designing gadgets to probe the surface and sub-surface of the red planet, the results hint at the need to scrounge for toxic chemicals that could hinder efforts to establish a sustainable agricultural system 400 million km away! Buoyed by the success of Mangalyaan-I (Mars Orbiter Mission or MOM), the top brass at the Indian Space Research Organisation (Isro) has the best of brains from laboratories across the country (unlike MOM which was designed by in-house experts of the space agency) to pool in their brilliance for assembling unique gadgets to scoop up Martian soil and scan every grain for chemicals and minerals of all kinds and hues. These studies are intended to throw light on evolution of planets, how life commenced in our solar system, and the interplay between geological and possible biological history of the solar system as well. “The response (from scientists outside Isro) is good. We have committees which are going to look at them (proposals submitted by these scientists) soon,” says A.S. Kiran Kumar, Chairman, Isro, about this country-wide effort to carry out the exploration of Mars and thus join other space-faring nations which are gradually setting the stage for human colonies on the red planet, complete with an agricultural system to feed the residents. As for an international partner, it could well be France’s national space organisation, Centre National d’Etudes Spatiales (CNES), as a letter of intent has been signed between the two space agencies for collaboration during India’s second visit to Mars. For Dr Wieger Wamelink, whose research costs are covered largely by crowd-funding and in part by the Wageningen University & Research Centre, lack of funds has not deterred him from pursuing studies that aim to determine whether people can keep themselves alive on Mars by growing crops on the red planet. He borrowed stimulant soil from the US-Nasa, drawn from a volcano in Hawaii (Mars) and a desert in Arizona (Moon), to grow crops such as green beans, peas, radish, potato and tomato, but has been unsuccessful with spinach. He was obviously thrilled when he found the offspring of two adult earthworms he had introduced to observe whether they can survive and propagate in alien soil. “The offspring are extremely important. On Mars and the moon, nothing can be allowed to get lost, including dead plant parts that are not eaten. They have to be brought back in the soil, decomposed to give manure for the next generation of plants. Worms can help in this process as they take the dead material and bring it in the soil, digest it, mix it with sand and then excrete it. 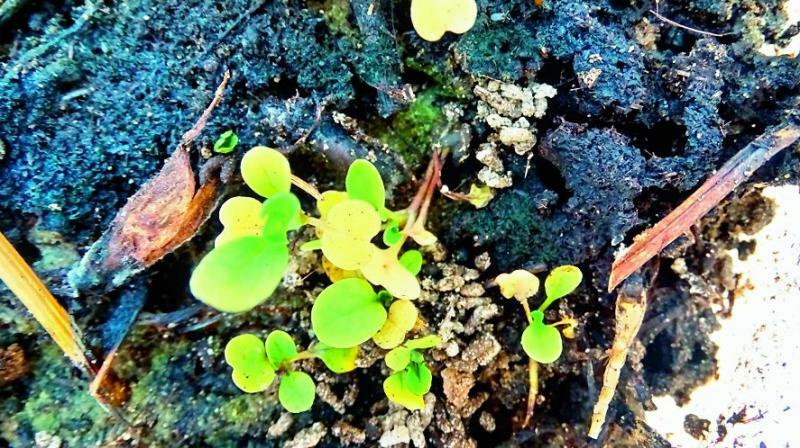 This fertile soil can then be further broken down by bacteria, releasing the nutrients for the plants. The worms will die in the end of old age, and to keep the system going, young worms must be born,” Dr Wamelink explained in an e-mail interview to this paper. Dr Wamelink will also shortly commence studies on the impact of cosmic radiation on the growth of plants as Mars lacks the atmospheric shield possessed by earth. Clues for some other puzzles about the Martian soil, and tips on how to turn it into a favourable landscape for cultivation of crops could come from Mangalyaan-2.